“We have lost 25 percent of the world’s corals in the last 25 years,” Mote Marine Laboratory’s David Vaughan told the New York Times, adding that we are going to lose another 25 percent in the next two decades. There are many reasons for the loss of these exquisite underwater creatures. Vaughan lists over-fishing, pollution, disease and even snorkeling. And then there is a two-fisted attack from carbon emissions. As oceans warm, the growing conditions for algae change. Coral and algae have a symbiotic relationship. If one partner suffers, the other also goes into decline. But in addition to water temperature, the chemistry of the ocean is changing. All carbon emissions from burning coal, oil and natural gas go into the atmosphere, but they don’t all stay there. According to UW and NOAA scientists, in fact, about half of all fossil-fuel carbon emissions since the Industrial Revolution have been absorbed by the oceans. The extra carbon dioxide turns the oceans more acidic. A chemical chain reaction makes it more difficult for coral to thrive and in some cases even causes the sea creatures to dissolve. The danger could be widespread, UW/NOAA scientist Richard Feely says. 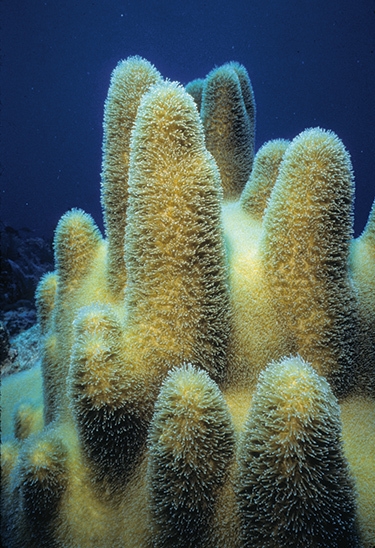 In addition to coral, tiny sea creatures may lose their protective armor or even their skeletons due to the changing chemistry. Oyster and mussel shells may become thinner. Even some types of crab may suffer. We may be facing a massive die-off of species at the bottom of the marine food web. While the University of Washington is a leader in researching this and other aspects of carbon emissions, it is doing more than just studying this problem. In March, the UW became a charter member of the Leadership Circle of the American College & University Presidents Climate Commitment, agreeing to adopt policies that minimize carbon emissions. The UW is also a founding partner of the Seattle Climate Partnership and has pledged to reduce greenhouse gas emissions by 2012 to seven percent below the levels in 1990. The UW is preaching what it practices, too. The 2007 common book—which all entering freshmen and transfer students are encouraged to read over the summer—is Elizabeth Kolbert’s award-winning Field Notes from a Catastrophe: Man, Nature, and Climate Change.